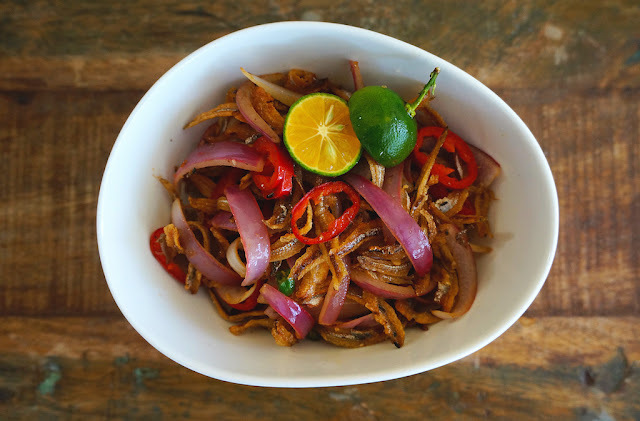 These Fried Anchovies With Onions And Chili are a popular Malaysian bar snack. It's also served as an appetizer or side dish at most home. The anchovies should remain crispy, slightly salty, sour, spicy and the onions are lightly softened without the raw taste. Heat oil over high heat. Toss in the red onion and chilies. Stir-fry until the onions are lightly soften and mix in the crispy anchovies. Give it a quick mix, toss well and transfer to a bowl. Squeeze some Kalamansi lime, mix well and serve immediately.